When it comes to traveling with your cat, you want to make sure you carry them in a comfortable carrier, and one which will keep them happy during the journey. Pet carriers come in all sorts of shapes and sizes, and it is important to find one which suits your individual cat. Many people struggle when it comes to putting their cat in a new carrier as they find their cats fight going inside. Often this is due to not being accustomed to the carrier and feeling trapped. Cats are independent creatures, and do not like being forced into a small, dark place – a lot like us humans. Therefore, it is important to find a pet carrier which they really like, and one which they will not have any problems going into. In this article, we present a few pointers on cat carriers, what you should look for when purchasing, and how best to prepare your cat to travel in one. A product review is then given on a popular pet carrier, the luxury soft-sided pet carrier by Pet Magasin. There are a couple of things you should take into consideration before purchasing a pet carrier. Purchasing a pet carrier can seem difficult as there are quite a few different styles to choose from. The main styles you are likely to find are hard and soft-sided cases. Hard-sided cases are the more traditional pet carriers which almost resemble a small pet cage as they are hard, rigid, and feature one front opening with a latch. These feature a small handle and can easily be carried. 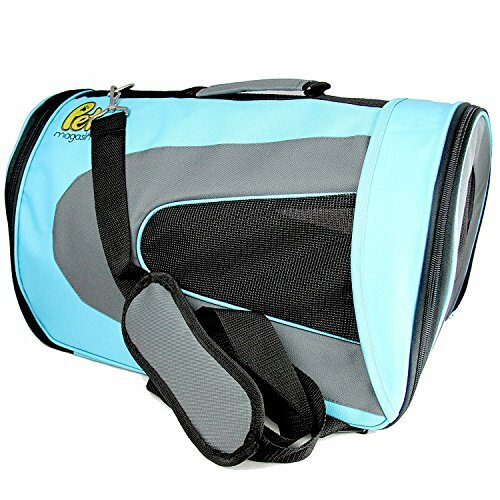 Soft-sided pet carriers were designed with comfort in mind. These are more suited to cats as they open at two points – the top and also the front – giving you different ways to reach your cat or put them in the carrier. The hard-sided cases are sometimes not preferred as cats can be known to slide up and down inside during transportation, whereas the soft-sided make a more comfortable environment and help keep cats relaxed. As well as choosing the right design, it is also important to choose a carrier of the correct size. The type and size of carrier you choose is ultimately down to the size of your cat. Some hard carriers may be more suited to larger, fatter cats, while soft-sided may be best suited to smaller cats or kittens. Measuring your cat’s dimensions may be useful when it comes to shopping for a new pet carrier as you will want to make sure you buy something that is fitting, and doesn’t make them feel trapped. Initially, most cats do not like being lifted into pet carriers as they are so used to doing their own thing, and less used to being controlled. Therefore, most owners highly recommend familiarizing your cat with a new pet carrier prior to taking them out in it. This method is really useful and works. Simply place the new pet carrier in their favorite spot, whether that be in the living room or in the bedroom, and allow them to interact with it as much as possible. You can even entice them with a few of their favorite foods and even let them eat and sleep in it. The sooner they become accustomed to it, the better it will be when it comes to taking them out in it. Looking for a pet carrier that is both durable and fashionable at the same time? Pet Magasin has a product for you. We will take a look at their luxury soft-sided carrier in more detail below. Pet Magasin are experts in making quality pet products which pets love. They strive to make the best pet products possible, spending hours on developing and testing, to ensure a quality result. Their cat travel carrier is no exception, and a product which is popular with many cat owners. When traveling with small pets, certain carriers may be too small or too large. The best thing about this carrier is that it is designed to fit airline regulations, giving you complete peace of mind when hitting the airport. There’s nothing worse than having a pet struggle to get out of their pet carrier as they don’t like it, or are sliding about with no comfort. With the Pet Magasin carrier, there are soft sides and padded floors which automatically increase the comfort levels inside, giving your cat a much cozier environment. The luxury carrier weighs around 2 pounds, which adds little to the weight of your pet. It features a suitcase-style handle with a removable and adjustable padded shoulder strap to allow for easy, comfortable carrying. Pet carriers are a product which will make transporting your cat a lot easier, and a purchase you will be glad of. 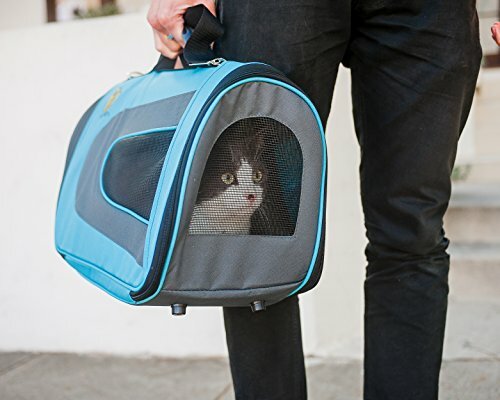 If you are a first-time cat owner, a soft-sided carrier may be easier for you to use as they can provide a lot of comfort to your cat and reduce their stress levels when traveling. A carrier such as the Pet Magasin Carrier is a good product which is worthy of your attention. We hope this article has helped to inspire you a bit more on the benefits of a good, quality-made cat carrier.